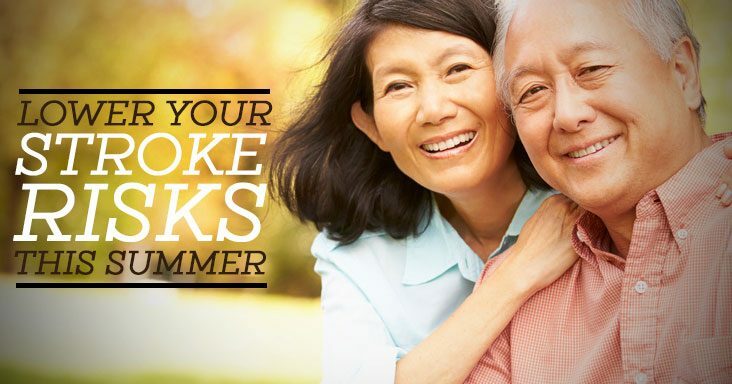 Summer is a great time for a lot of things – barbecues, outdoor activities, vacations…but what you may not think about when it comes to summer is using all it has to offer to lower your stroke risks. Strokes – or brain attacks – are the leading cause of adult disabilities in the United States, and can happen to anyone at any time. According to the National Stroke Association, nearly 800,000 people experience strokes every year. One of the biggest myths regarding strokes is that they can’t be avoided. But in reality, nearly 80 percent of all strokes can be prevented by controlling lifestyle risk factors, or habits that we engage in that can be changed to improve our health. Buy and eat fresh produce. Visit your local farmer’s market or grocery store to find in-season, fresh fruits and vegetables. Eat them in their natural states. Eat less salt. Eat fresh vegetables versus canned items, and your salt intake will decrease. Visit the beach. Eat more seafood (at the beach or not) instead of red meat. Enjoy the outdoors. Get active outside during the warmer and longer days. Put the cigarettes down. Summer usually is less stressful. Use it to your advantage to try to break the habit. Shoot for your healthy weight. Healthy eating and activities may help you reach a healthy weight (if you’re not already at it).